When we check into an amazing hotel, the first thing we want to check out is the bathroom (of course!). However you don’t need to leave your own home for a hotel experience – we go through some key ways to bring 5-star luxury into your own bathroom. One of the most common things we hear from people is “I LOVE those big rain shower heads you get in hotel bathrooms!” but for everyday living, they don’t necessarily want to have that immersive waterfall experience all the time. What about non-hair wash days? Or giving the shower area a quick rinse at the end of a shower? Why not have both? The 12″ Aqua Piazza Collection takes pure and simple geometric forms and composes them into an expression of modern luxury. The unapologetic angularity of the faucet is juxtaposed by a flow of water that is surprisingly laminar and gentle. Aqua Piazza is the product of an intimate cooperation between design and German Engineering. It’s easy to be overwhelmed by how many bathroom products are on offer nowadays. To really make your bathroom stand out, decide on one or two centrepieces to invest in. 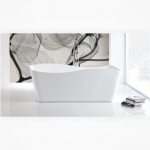 Think stunning freestanding baths or bathroom furniture that elevates your space to hotel luxury status. Make these kinds of items your “must-haves” and then fill the blanks with your “lust-haves”. 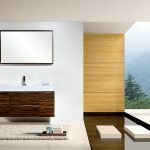 Not only will you be able to have the items you can’t imagine your bathroom without, but it will also help with budgeting (bathroom projects can easily get out of hand!). There’s no denying it – metallics are so hot at the moment especially in the bathroom. 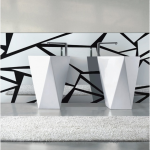 Chrome has been the hero and gain popularity in the bathroom space. For something a bit more glam, consider Chrome finish. For something more subtle, gun metal or a brushed finished. The Aqua has had a huge hand in pushing new design to the forefront of people’s minds and it doesn’t seem to be slowing down any time soon. 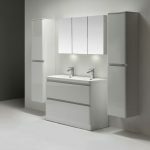 Bathroom vanity countertops made of a single slab or material like stone can have a finished edge around the sink cutout. This edge means that the sink itself can be mounted to the underside of the counter, rather than hanging from the top and concealing the cutout’s edge. The sink is held in place on the underside by special sealants that both bond the sink into place and help prevent water from leaking out through the join at the sink’s rim. While vessel sinks and drop-in sinks are mounted after the counter has been placed on the vanity and sealed into place, undermount sinks are installed first. It takes time for the sealant to cure, holding the sink securely to the underside of the stone. If the top is in place when the sink is mounted, gravity may work against the sealant, possibly pulling the sink away from the counter before it has time to dry. Instead, flip the counter upside down on a flat surface and attach the sink there. After 24 hours, the counter can be flipped back over and installed on the vanity. When stone counters are produced, a lot of stone dust may get left behind on the underside of the counter, which is rough and unfinished. This textured underside can trap and hold a lot of debris, which can interfere with the bond between the sink and the stone. 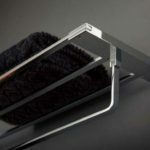 Before attempting to mount a sink to the underside of the counter, clean it well with a stone cleaner and a soft cloth. Let the stone dry completely; a damp stone will appear darker in color than dry stone will. Wait for the color to return to normal before applying the adhesive. For most bathroom undermount sinks, all that is needed to mount the sink to the stone is a silicone adhesive. Squeeze a very thin line around the sink cutout on the underside of the stone. The weight of the sink will compress the adhesive slightly, making it spread out, so a thin line is all that is needed. Lower the sink into place, upside down on the countertop’s underside, then lift it straight up again. This will cause the adhesive to pull away in small “strings” from the counter to the sink. The air hitting these strings will make the adhesive bond stronger. Lower the sink back into place and leave it undisturbed for 24 hours to dry. 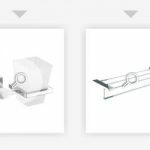 The majority of undermount sinks only need adhesive to bond them to a vanity counter, but some large or oversized bathroom sinks will also use mounting clips. This small metal clip fastens on posts to both the sink and the stone top. Epoxy is used to attach the posts to both materials, then the clip is slipped over them and a small nut is fastened down on each post to hold the clip in place. The epoxy will cure hard enough to fasten the clips onto the posts in approximately 10 minutes, but the clips still need a full 24 hours to dry before the counter is mounted into place. When bathrooms are small and tight, a wall-hung vanity is an ideal way of making the space feel more spacious. The vanity not only opens up the bathroom and makes it feel bigger; it also brightens the room and makes cleaning the floors easier. 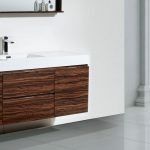 Additionally, a wall-hung vanity adds a modern, contemporary touch in even the most traditional of homes. With an easy installation job, wall-hung vanities may become the centerpiece of any bathroom. Before installing a wall-hung vanity, the first step is determining the final location for the vanity and marking out the area. This gives the homeowner an idea of how the vanity and mirror should fit into the space. If necessary, this is the time for making adjustments to the placement of the vanity. 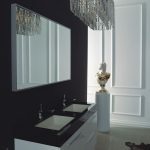 For bathrooms that already include a vanity, the best location is where the old vanity resided, because that is the location of the plumbing, drains, and water lines. After determining the location for the wall-hung vanity, draw the outline of the vanity on the wall and mark the depth of the vanity on the floor with masking tape. This helps prevent against any obstruction in the bathroom, such as pathways or fixtures. Once the outlines are in place, use a stud finder and mark the location of the studs on the wall, keeping these marks outside of the outline of the vanity. After locating the studs, measure the distance from the edge of the vanity outline to the drainpipe sub-out and water supply valves, and then transfer the measurements onto the back of the vanity. After marking the locations of the plumbing on the vanity, use a drill and cut access holes in the back of the vanity. For an easier time setting up the plumbing, cut the access holes larger than the actual size of the pipes. Next, lift the vanity and put it in place against the wall, taking care that the vanity remains inside of the markings on the wall. Because nobody wants a crooked vanity, use a level and ensure that the vanity is level and even. Hold the vanity in place by placing wood shims or blocks underneath it. Once the vanity is set in place, screw the vanity into the wall by drilling wood screws through the back of the vanity. When screwing it in place, use the stud location markings as a guide for placing the screws, which helps prevent the vanity from falling off the wall and tearing the drywall. Next, spread a layer of silicon caulk evenly along the edge of the sink opening before resting the sink in place. The next step in installing the wall-hung vanity is inserting the faucet. Begin by taking a bit of plumber’s putty and rolling it until it forms a 1/4-inch diameter rope. Apply this rope around the base of the new faucet spout, which prevents water from leaking into the vanity. After applying the rope, place the spout in the hole in the vanity and tighten the nut on the underside of the vanity with an adjustable wrench. 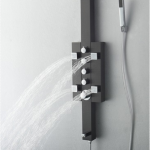 If the faucet includes separate hot and cold handles, assembly of the hot and cold mixing valves is necessary. 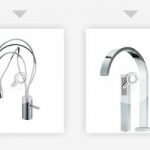 For these double-hole faucets, a C-clip holds the valve on top of the vanity while a nut and washer tighten it from below. When assembling the mixing valves, begin by applying plumber’s putty underneath the top washer, install the C-clip, and then finish by tightening the nut below the faucet. Remember when installing the valves that hot water is on the left and cold is on the right. After the faucet and mixing valves are in place, the final step in installing a wall-hung vanity is hooking up the water lines and drain rods. While some faucets include easy snap-end fittings for the water lines, others use threaded fittings that often need plumber’s tape. Once the water lines and drain rods are installed, the wall-hung vanity is ready for use. Il n’est pas toujours facile de trouver la formule gagnante pour moderniser la salle de bain, les étapes à planifier sont nombreuses et nécessitent une réflexion mûrie pour maximiser le côté pratique, sécuritaire et esthétique de celle-ci. 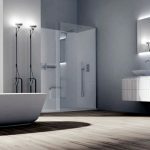 Ces 5 points clés vous aideront à bien planifier le projet pour réussir la rénovation en toute quiétude. Si vous prévoyez changer les sanitaires d’emplacement, sachez que ce n’est pas chose simple. Les arrivées d’eau devront être déplacées et la tuyauterie d’évacuation peut causer problème. Elle doit avoir une pente suffisamment prononcée pour évacuer les eaux usées. Ce qui signifie que plus vous éloigner les sanitaires de leur emplacement initial, plus il y a de chance de devoir abaisser le plafond de l’étage du dessous, ou de surélever le plancher de la salle de bain en totalité ou en partie. Pensez-y ! Dans cette pièce, il est primordial de choisir un revêtement de sol résistant à l’humidité. C’est pourquoi la céramique reste le matériau par excellence dans les salles de bain. Mais encore faut-il respecter les caractéristiques particulières qui s’appliquent pour ce genre d’utilisation. Vous devriez donc à tout prix éviter les surfaces émaillées lisses ou vitrifiées qui augmenterait le risque d’accident au contact des pieds mouillés. Privilégiez plutôt les surfaces mattes, légèrement texturées et résistante aux agents chimiques lorsqu’il sera question de nettoyage. 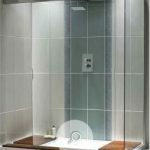 Quoi de plus important dans une salle de bain que l’éclairage. 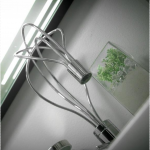 Dans un monde idéal, on devrait retrouver plus qu’une simple ampoule pour éclairer efficacement votre salle de bain. 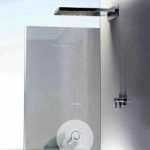 Au-dessus du lavabo, on opte pour une lumière de face, placée de part et d’autre du miroir. On évite l’éclairage directement placé au-dessus de la tête : Il éblouit et créé des ombrages disgracieux qui complique le maquillage et le rasage. Pensez équipez les luminaires de gradateurs, vous adorerez quand viendra le temps de relaxer dans un bon bain chaud. Dans cette pièce, évitez le festival des couleurs. Bien entendu, ne vous sentez pas obligé d’opter simplement pour les tons neutres mais privilégiez néanmoins les teintes claires. Le bleu est notamment apprécié dans cette pièce, il est à la fois reposant et rafraîchissant. Oubliez particulièrement le jaune et plus spécifiquement les verts aux nuances de jaune car ils sont moins flatteurs pour le teint. Pensez également utiliser une peinture semi-lustre car elle est moins perméable à la condensation. 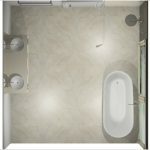 Puisque le lavabo est l’élément le plus utilisé de la pièce, il doit être bien éclairé et des espaces de rangement doivent se trouver à proximité. À ce niveau, soyez créatifs ! Le facteur le plus important demeure la dimension du meuble, optez toujours pour le plus grand modèle possible tout en respectant les espaces de dégagement et de circulation. Vous ne le regrettez pas ! The centerpiece of this bathroom is the stunning freestanding bath. The centerpiece of this bathroom is the stunning freestanding bath, perfectly positioned to take advantage of a gorgeous tree-filled view. 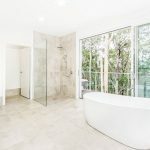 This is a true retreat, with a luxurious walk-in shower and double vanity making it the perfect ensuite for any couple. The neutral colour palette keeps the space feeling calm and helps to focus attention on the outside view.